One of the most difficult services to provide online is customer service. In over ten years of developing web sites, I cannot recall seeing a customer complaint that specifically refers to the usability of a site. This has little to do with the level of development or usability used. If a user is unhappy with their experience at your web site they probably aren’t going to say anything about it. In most cases they just won’t return to your web site or use your online service. 96% of consumers do not complain about rude or discourteous service. 90% or more of consumers who aren’t happy with the level of service will not buy or come back again. The cost to acquire a new customer versus keeping an old one is five times greater. When you take this data and apply it to the Internet far few people are likely to complain. It is far easier not to visit a web site than follow up with the company and try to resolve the problem. Make sure you go out of your way to ensure your users are happy. One of the easiest places to start is with emails you’ve collected. You should be conducting follow up on almost everything you do. It can be anything from a product purchase follow up to answering a complaint. Both positive and negative emails are a great opportunity to gain valuable insight from your user. You can make use of automation to collect survey data and other valuable information. Use that information to improve your online experience. There was one very important piece of actionable information that TARP provided. 95% of unhappy customers will do business again with you if their issue is resolved immediately. Your window of opportunity might be narrow and short, but you still have time to do sometime. Use the speed of technology to quickly recover from a customer service issue. Greetings from Mont-Tremblant, Quebec. The views here are majestic. But I don’t believe I’ve ever been this cold in my entire life. This is honestly the coldest weather I’ve ever experienced, -29 Degrees Celsius or -20 Degrees Fahrenheit. All in good fun. Traditional Advertising is highly competitive. As additional advertisers enter the game more advertising pollution is created. When your user opens a newspaper or turns on the television they are bombarded with advertisements. Most consumers don’t even know where to start. How many times has your advertising been lost amongst other advertising? Everybody is jockeying for attention. The web is distinctly different. Each web site represents a different channel of very specific programming. The catch is ensuring users can find and remember your domain name. You can build awareness through traditional marketing channels by consistently repeating your domain name. The best part is when users load your site you command your prospect’s undivided attention. Users who aren’t interested in air aren’t going to visit your web site. This is unlike other advertising where the consumer is almost forced to watch or listen to something of little or no interest. Your domain name should be a marketing focal point. This is the premise behind web centric marketing. It is the single most important piece of marketing information that you want your perspective customers to remember. If they can remember your domain name, they don’t need to remember other specific details. Every advertising channel has it’s own unique way of delivering your message. It’s up to you to determine the best way to position your brand. If you have print advertising make sure your domain name is a prominent element. Just listing the domain name isn’t enough. Entice user with unique information only available on your web site. Use your web site statistical data to analyze which forms of marketing were most effective. If you know when a certain marketing campaign started go back to your web stats and correlate the data. You might find one marketing channel worked better than the other and adjust future campaigns. Involvement devices are methods of getting your prospects involved with your web site or your offer. They also assist you in converting your prospects. In Epcot’s United Kingdom showcase, I observed a great involvement device. One of the English “cast members” (Disney’s name for employees) was behind a shoppe sales counter. On the sales counter was a small chalk board listing ten questions about the United Kingdom with the heading “Can You Answer These Questions?” It could have been pure coincidence, but a few moments after I noticed the chalk board a family inquired about the questions. They spent the next five minutes talking with the pleasant young lady from the United Kingdom, complete with an English accent. (Disney brings people in from each individual nation to work at their World Showcase.) I’m not sure if the interaction resulted in a sale, but I know that the people spend a significant amount of time at the sales counter. After five minutes of conversation with the lovely young lady from England I’m sure they were quite charmed. That simple interaction also increased the probability that someone from the inquiring family would make a purchase. The previous example shows a simple disarming process to get users involved in your message or web site. You should think of ways to integrate something similar on your web site. You can use online surveys, checklists, or interactive media presentations. High quality content is the simplest form of an involvement device. It allows you to capture people’s attention. At the same time don’t confuse involvement devices for hype or trickery. Your efforts and information need to be sincere and truthful. Users are already skeptical of anything they see online. They’ll see right through any trickery. Use communication as an involvement device. Encourage people to contact you beyond just online forms and email. Too many people hold the false assumption that because you have a web site that everything should be automated or computer driven. Email and online forms are a one way communication channels. Think of other ways to get people involved. What takes a few emails and a half hour of time to accomplish via email could probably be resolved in a 5 minute telephone call. There are any number of ways to engage people online and offline. Involvement devices are a great low pressure ways to keep people on your site or deliver your message. Think of what you can do to keep people on your site and open lines of communication. There are multiple approaches to create a trust building process. It’s up to you to figure out a creative hook. Don’t forget to be sincere. Focus on getting people great information or honestly answering their questions, not on making another sale. Recently I was fortunate enough to visit a number of different nations during a whirl wind tour. The day long journey included Canada, Norway, Japan, and Mexico. The evening finally culminated back at the United States for a spectacular fireworks show. The best part of my journey was that it all occurred within an area of about a half mile. My adventure came courtesy of the Walt Disney people. By the end of the day I had plenty of new ideas and lessons learned. It was a unique way of observing extraordinary marketing in motion. I believe that any business person can learn a lot from the simple process that Disney uses at their theme parks. They excel at creating Lifetime Value Customers and generating additional revenue after each ticket purchased. Most adults are paying around $65 USD for the park entrance fee. I haven't been able to find any statistics, but based on my observations while visiting Epcot I would safely estimate that each adult probably spends an additional 50% - 75% past their ticket fee. They spend it on food, beverages, and any number of novelties. All of this occurs in a low pressure environment. They don't manipulate the customer to buy and deliver value all day long. Epcot and the World Showcase is great example of passively unique marketing. When you enter the park you are free to choose which attractions you'd like to experience. Their target market is pre-qualifying themselves for additional purchases upon entering the park. When you finish almost every ride or attraction you exit into a conveniently placed gift shop or other areas with tantalizing offers. The staff is extremely pleasant and happy to answer additional questions about the ride or offered products. This sort of process and environment makes it much easier for people to buy. P.T. Barnum would be envious. 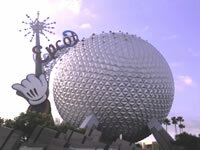 What does Epcot and Disney have to do with my web site? You can use a similar sales process to promote online revenue generation. Just like Disney, you can create individual attractions via different web sites that target certain markets. People visit the attractions that interest them, the same hold true for web sites. How many times have you returned to a web site that didn't hold your interest? When your target market shows up, shower them with high quality content. Lead them through an "edutainment" process of what you have to offer. This helps you get your prospects involved in what you can do for them. You need to build trust with people before you can expect them to make a purchase. Disney theme parks make use of sales lures throughout the day. Some of their lures include live music, street entertainers, and fireworks at closing. There are no sneaky sales techniques here or need to pressure people into buying something. Their objective is to keep people in the park. Successful online business people know they need to keep users at their site for more than just a quick look. Give your users a reason to stay at your site. This can be through ancillary information that supports your product or service. These include simple things like testimonials and product reviews. Stay user focused in everything you do. Are You Creating Lifetime Value Customer? Disney also creates Lifetime Value Customers. They're much like Amazon and Ebay in this regard. The Disney people keep their customers so happy that they keep coming back and interested in trying new things. If you have a new offer or product, test it with your existing customer base. Your customer base has already demonstrated some level trust and credibility in your business. Disney can port their movies and theme parks across a wide customer base. They get people to think to themselves "If I had fun there, I'm sure their other offerings are going to be worth my time." The same thing happens online. Many people who buy from Ebay or Amazon don't just purchase or sell once. Many people come back to buy their products. If you want to generate consistent revenue online you need to keep your customers coming back. It is much easier to sell to an existing customer as opposed to paying to market and acquire a new one. I hope that some of the simple examples described assist you in creating a better sales experience and Lifetime Value Customers. It started with a telephone call from an unhappy Air Force Major. He wanted to know why I hadn’t responded to his email. My first thought was “what email?!? !” I double checked my email Inbox and there were no messages from him in months. After a telephone call the issue brought up in the email was eventually resolved. Unfortunately the time wasted between us playing phone tag and actually solving the problem added up to at least an hour or two. I eventually found his email in my SPAM folder. The software I was using tagged the email as potential SPAM. I spent time going over documentation and everything on my filter seemed properly configured. This is an example of how filtering SPAM can interfere with legitimate email. Nobody likes spam. My personal SPAM record is somewhere near 300+ messages in one day. We all have to deal with it. The most difficult thing can be filtering the good from the bad. The case presented above illustrates just one example of misdiagnosed SPAM. My two recommendations for the day are to configure your spam filter properly and have a backup plan in place if email fails. I believe the best way to deal with SPAM is at the individual email account level. We host a number of web sites for various companies. Clients call me on a regular basis about the amount of SPAM they’re getting in their mailbox. The challenge for any hosting company or email provider is filtering the good from the bad. As soon as you filter a legitimate piece of email, you’re in trouble. We can configure SPAM filtering on the server, but it isn’t perfect. You can’t guarantee someone that legitimate email won’t be filtered. I believe that people should manage SPAM at an individual level. One of the most important things you can do with your email is ensuring that your SPAM filter is setup properly. Start with your SPAM filter documentation. Too many people use restrictive default settings and filter good emails. I see this happen all the time. Set your SPAM filter to an acceptable level to significantly reduce SPAM. If you are too restrictive or use default settings you might block legitimate emails. Some filtering programs allow you to backup your settings. Find a setting that works best. One of the biggest annoyances of email is people using it as a scapegoat. I hear it all the time “I didn’t get your email.” If you send an email and someone doesn’t respond within a reasonable amount of time, pick up the telephone and call them. This simple, yet often forgotten, process can save you a time and headache. Take responsibility by picking up the phone and asking someone “did you get my email?” Don’t make any judgments, just ask. Computers only do what people instruct them to do and people aren’t perfect. It’s a match made for disaster. When it comes to SPAM filters, double check your setup and go to the phone as a backup. When you conduct any sort of usability test you always want to concentrate on your user demographic. Users from your demographic are the people that need to be able to understand and easily navigate your web site. Web sites rise and fall upon the support of their user base. For of our usability studies we also include a group of people from outside the demographic. These outsiders are commonly known as Least Competent Users (LCUs). In many instances they provide some of the most insightful feedback and suggestions. Who Are Least Competent Users? When people first hear the term LCU they usually jump to a false conclusion. Don’t confuse the least competent portion of the LCU acronym to be indicative of a user’s intellectually ability or personality. The “Competency” refers to the user’s computer or the Internet skills. Their computer skills are novice at best. This makes them an ideal candidate to test almost any web site. One of my favorite LCUs is a family member. Why Are LCUs Good Usability Testers? If the LCU understands the purpose of your web site and navigation you're testing, there is a high probability that regular users shouldn’t have a problem with the site. LCUs don’t tend to get down in messaging or other features that would annoy a seasoned web surfer. Because of their rudimentary approach they don’t need to be within your testing demographic. You’re looking for them to provide very basic feedback. We find the best time to utilize Least Competent Users is after completing testing with usability participants from the site’s demographic. By the time we’ve finished testing with users from the site’s demographic most of our trends have been identified. Concentrate on testing the most basic functions of the web site. Do they understand the point of the site? Can they use the navigation to get around the site? If you try to get them lost on the site can they find their way home? Take them through very simple routines. There are times when it is very easy to get frustrated with LCUs. You always need to remember that Least Competent Users don’t use computers or the Internet on a regular basis. Don’t give LCUs overly complex tasks. Have them concentrate on a macro view of the web site. Encourage them to give constant feedback. You should reinforce that there are no right or wrong answers. Tell them the more feedback they give the better. Most people open up to you with a deluge of comments. If you are looking for great usability feedback, consider a Least Competent User. You’ll be surprised what you can learn. When You Run on the Beach . . . Lately I’ve been doing quite a bit of running on the beach. The beach is probably my favorite running surface. It’s more difficult to run fast but you don’t get as much impact as hard surfaces like pavement. The information below was collecting by running hundreds of miles on Florida's beaches. There is nothing like a sprained foot or prickly heat rash to get you thinking, "I wish I would have known that before I started!" Feel free to comment and add your own suggestions below the post. Run at or near Low Tide. It is significantly easier to run around Low Tide. The beach tends to be firmer and flatter at Low Tide. The Internet is usually a pretty good place to find tide information. If you have a GPS unit they are usually equipped with tide information. To find more information on tides visit the following site: Tide and Current Predictor. If you run going into a low tide period the surf tends not to creep up on you. Why NOT run at High Tide? If you try running at High Tide you are running higher on the beach and usually at an angle. The sand is also significantly softer and very uneven, making it more difficult to run and easier to hurt yourself. The few times I’ve tried to run at High Tide my knees and hips took a beating. It took almost four days from one High Tide run to walk without pain. If you are going to run longer than an hour, split the Low Tide. Start 60 minutes before Low Tide and then continue 30 minutes past. Adjust accordingly. Run close to the water and watch the surf lines. If you watch the surf you can choose the firmness of the sand under your feet. Don’t run too close to the surf or you’ll find yourself trying to escape getting your shoes wet. Wear sneakers and socks while running. I will admit running shoes and socks might not be the most fashionable. But, I’ve learned through a sprained foot and really bad blisters that socks and sneakers are recommended. There have been numerous occasions where I’ve passed broken glass, sharp sea shells, and jelly fish. Somehow stepping on those objects barefoot doesn’t seem appealing. Your sneakers also help in giving your foot better support. Take an old pair of running sneakers with you, they're likely to get wet. Arch support helps. Wear a High Quality Sunscreen. Even if you're out for a quick run, sunscreen is highly recommended. Two of my friends were in the intense Florida sun for just 45 minutes without sunblock . . . they had the worst sunburns I've ever seen in my life. Their skin was burnt so badly it went beyond "lobster red" and turned purple! Both of them were in pain for almost a week with blistering and ridiculous skin pealing. Why High Quality Sunscreen? Aside from preventing sunburn, you want to use sunscreen that WON'T clog your pores. Clogged pores cause sweat to get trapped below your skin and cause heat rash (prickly heat). Trust me, it is extremely uncomfortable. Lately, I've been using Neutrogena Healthy Defense Sunblock Lotion, Oil-Free SPF 45 with good results. Stay way from cheap sunscreen, you get what you pay for! Also consider showering and gently scrubbing down with a good loofah and shower gel after your run. Twilight Beach Jogs - Running at night is actually pretty easy and just a darn cool thing to do. It helps if you can find a night where the moon is up to light your way. You'd be surprised at how much you can see. Again, I'd recommend splitting a low tide. Running is yet another great way to generate ideas. Unfortunately it is not the most conducive environment for taking notes. There are portable voice recorders and small note pads, but I have yet to find anything that is not cumbersome. If you enjoy running and you’re going someplace with a beach, pack those running shoes. Recently I’ve been researching a number of web sites. There are few sites that hit the mark when it comes to delivering a usable and compelling online experience. Today I have a few short musings about page layout. The first place most users enter a web site is the home page. It is important to note not everyone will enter your site through your home page. Ask yourself this question: Are your users able to quickly orient themselves while entering other pages of your site? Just because you can make your site look like Vegas, doesn’t mean it needs to look like Vegas. Many companies and developers feel compelled to cram as much onto the home page as possible. Users are presented with so many options they don’t know where to start. How many times have you visited a web site and quickly become lost? It’s similar to a cover of a book or first impression. Smartly limit the number of options you present to the user. There are certain simple steps anyone can take to help their user get more from their web site. One of the easiest ways to draw users into your web site is with a compelling headline on your homepage. Headlines are a great way of quickly orienting your users. It is an invitation to read further if the user feels the content is relevant to their needs. Frame your headline to appeal to the interest of the user, not your self interest. Many people use headlines to determine if it worth clicking on a link and reading further. Our displays are getting larger and people are using higher screen resolutions. Several people think that you should maximize the use of your on screen real estate. Because you have the space to use doesn’t mean you must use the space. Use an appropriate amount of white space around text and images. White space is like breathing room or a margin around elements. It assists in keeping the page from being overcrowded and helps create a balanced design. You don’t need to fill up the entire screen with content. Keep your design and navigation consistent throughout your web site. Standard places for navigation are horizontally along the top or vertically along the left. One of the quickest places users get disoriented in usability tests is navigation testing. They read a link title and click on the link based on their expectation. They become disoriented or disappointed because the link didn’t accurately reflect the content. When users click on the navigation they should be taken to a page that reflects the navigation title. Navigation headings should be succinct and to the point. There are very few web sites you can visit without being inundated with advertising. Several web sites need the advertising to generate revenue. I recall reading a case study years ago regarding pop ups and advertising. Some users actually placed stick it notes on their monitors to cover annoying advertisements. Today many users have trained themselves to ignore ads. News sites are one type of web site where people seem less averse to advertising. One common suggestion in the usability and design world is to make sure your links and images don’t look like advertising. Your users might ignore important information. Make sure your web pages are easy to use and easy to understand. The information you present needs to be relevant to the user and shouldn’t overwhelm them. You want to create an experience that compels users to return or take action. Have you ever visited a web site and thought to yourself, "How did they do that?" You can save yourself a great deal of time by learning from others online. Today I want to share a simple technique for finding out how some web pages are built. The technique doesn’t work all the time and it isn’t perfect. But unless you’re a developer, the technique is much easier than trying to interpret code. You’ll need Internet Explorer and Dreamweaver. Start with (IE) Internet Explorer. IE does a good job of downloading and saving html and graphical elements on a web page. Load the page you're trying to analyze in IE. Go to the file drop down menu and select “Save As …” Then, save the page to a location that is easy to remember. After the file has downloaded start up Dreamweaver. If you don’t have Dreamweaver you can always download a free 30 day trial at Adobe.com. Load Dreamweaver and select the “Open …” option for the file you just downloaded. You’ll rarely get a perfect representation of what you see on the screen, but you can highlight code or design and interpret how things work. You might discover something that wasn't immediately apparent. It's far easier and cost effective to emulate someone else's wheel than invent your own. Hopefully this technique will assist you. HTML text is making a resurgence on web sites. In this post I refer to HTML in two different ways. One way as a markup language and the other as a way to display text. In the early days of the Internet most sites were built with images and HTML text. Over time developers gradually shifted away from HTML into other markup languages and technology. Developers claimed that HTML was too archaic to use. Yet today web sites are returning to HTML text. HTML has had quiet the interesting journey. Years ago when Flash came to town using HTML was no longer cool. Flash was to usher in a new era of web development. Companies all over the world wanted to use Flash on their web sites. The demand for Flash developers went through the roof. It was hard not to bump into a site guarded with a splash page utilizing Flash. Eventually people realized that Flash wasn't as great as once envisioned. Companies found that their users wanted information when visiting a web site, not a glorified commercial. The splash pages and flash menus disappeared and developers gradually returned to HTML. I believe that Blogs are a significant catalyst in the resurgence of HTML text. One reason I believe text is so important online is because you cannot do much on the Internet without words. BUY NOW, Click Here, Search, and Home are some of the most common words on the Internet. We are a society that is rooted in words either written or spoken for communicating. Make sure you don't make the mistake too many web developers commit. They create their web sites with image heavy design and little or no HTML text. Unless these sites have an abundance of back links they rarely rank well in search engines. If you are looking toward the future of your web site make sure you use HTML text. I recommend this to anyone with a web site. I'll take HTML over any other language on the Internet. Some of the simplest and most successful web sites use HTML text with graphics. There are no bells and whistles, just straight forward content. CNN, Yahoo, Amazon, and Google all use HTML text as their primary means of content delivery. HTML text might not be the coolest "kid" on the block, but over time it's proven to be the most versatile and easiest to use. I recommend anyone with a web site to build it on a foundation of HTML text. Does Your Web Site Load Quickly? Users have never wanted information so quickly on the Internet. In a previous article I examined the user attention span. One place where companies and site owners can make a noticeable difference in their web page quality is through web graphic optimization. Everyone likes a web page that loads in a minimum amount of time. But a significant number of companies neglect this simple process. Why Be Concerned with Optimizing Web Graphics? Optimization is a quick and inexpensive way to reduce the load time of your web site. There are a number of variables involved in getting your site to load in a minimum amount of time. Optimizing your web graphics is probably the easiest and most inexpensive way to tweak your site. Fast loading sites also contribute to higher web site usability. What’s Involved in Graphic Optimization? In optimizing web graphics you are reducing image quality. The compression algorithms take information out of the image and reduce the overall image size. You can start with a 250K image and through optimization reduce it to 35K. One argument I hear is with high speed Internet there is less of a need to optimize web graphics. This is a dangerous assessment that hurts many companies online. Web Graphics have a significant relationship to page load times. Web page load time is an important metric in relation to bounce rates. People have very little tolerance for slow loading pages. Our recommendation is to keep your pages under a 100K each. The key to good optimization is reducing image size without diluting picture quality. Try to reduce your original image size by approximately 50%-80%. You’ll have to experiment a bit to find the right amount of compression. If you compress the image and it starts to look lousy you’ve over optimized. You can use either Photoshop or Fireworks. There also a number of inexpensive or free programs for image optimization. Search Google for “Web Image Optimization” and you’ll find a number of options. Make sure you backup all your images before modifying or optimizing them. Once the graphic has been optimized you can’t increase the image quality. As a side note; you need to also take into account server load time. You can have all your web site graphics optimized. But if your server is slow, the benefit is significantly reduced. Talk to your hosting company and ask them to check your server response time. They should be able to quickly tell you if something is wrong. In conclusion I’ll leave you with this food for thought: Nobody will complain or "pat you on the back" if you have a quick loading web site. At the same time users probably won’t complain if it takes too long to load. They’ll just stop coming to your web site. I’ve worked with my share of graphic design firms over the years. It has been quite the roller coaster ride trying to get them to understand the differences between web design and print design. You need to recognize the distinct differences between graphic design and web design when building a web site. For this article graphic design should be considered the same as print design. Today I’m going to look at the differences between print and web design, Flash, and what to look for in a graphic designer. So graphic designers don’t think I’m picking on them, I want acknowledge there are a few really talented graphic designers that understand and respect the differences between print and web. It’s my hope that their peers take notice. Many designers view graphic design and web design as one in the same. This is most prevalent with firms transitioning from print and multimedia design into web design. They think that web design and print design are siblings from the same family, like brother and sister. My belief is that they are analogous to second cousins. There are a few similarities, but significantly more differences. The challenge becomes getting old school graphic designers to separate from their roots. I was once told by a graphic designer “You wouldn’t get it, you’re not an artist.” I think that graphic design can be considered analogous to special effects in a movie. The visuals can be amazing. Yet, if you don’t have a good story and dialogue it doesn’t matter how stunning the special effects. High quality pictures and multimedia will never trump high quality content. This was evidenced a few years ago when everyone and their grandmother were hopping on the Flash bandwagon. People wanted all the bells and whistles for their web site. You’ll notice that trend quickly died out. Web site owners quickly realized that Flash wasn’t the most ideal method for delivering content. There are very few sites that deliver high quality content utilizing nothing but Flash. As a side note: Flash have become an excellent delivery method for web video. Design firms usually endure a significant idea storm when creating web sites. In Steve Krug’s book, Don’t Make Me Think, he does an excellent job of talking about the differences between the various team members developing a web site. Artists are going to view the project differently than developers. When you add management into the mix you get even more differences in opinion. All of these opinions and ideas need to balance with what’s best for the client and the user. Take a look at Google and Yahoo. Together they account for approximately 150 Million searches daily. (Source: comScore Media Metrix) Users don’t go to these sites because of their graphic design prowess. They go to Google and Yahoo because the sites are easy to use and allow you access to an unbelievable amount of content. If you are in the market for a graphic design make sure they can demonstrate their knowledge of the differences between print design and web design. Have them tell you about their web accomplishments in relation to client success. They understand that good design helps to support great content. Good web designers present their work in terms of striking a balance between aesthetics and information.